For those of you out there who have better things to do with your spare time, there are basically four distances on the triathlon calendar. The short courses are Sprint, at 750m swim, 20km bike and 5km run (my usual distance); and Standard, at 1500m, 40km and 10km. The long courses are Middle, or half-Ironman, at 1900m, 90km, 21.09km (yahrly); and Full, or Ironman, at 3800m, 180km, 42.2km. There are a bunch of others, but of them you only really get the super-sprint or “try-a-tri” distance on the UK circuit, as far as I know. The Standard distance, compared to a Full, for instance, isn’t very long. But it’s double a Sprint, and I’ve only done Sprints for the last three years. I had intended doing Gullane last year, however I had surgery for a broken tooth a couple of months earlier, which ruined my training; and I had just put a stress fracture in my foot. 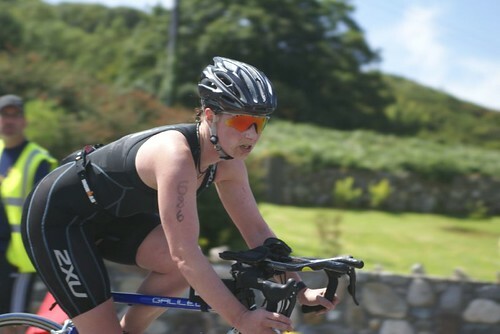 What possessed me to enter the Galway Triathlon Club‘s Triathlon Chonamara as my first standard as opposed to something sensible like, say, Gullane, or Strathclyde, I have no idea. That’s not strictly true, but it’s nothing to do with sports. 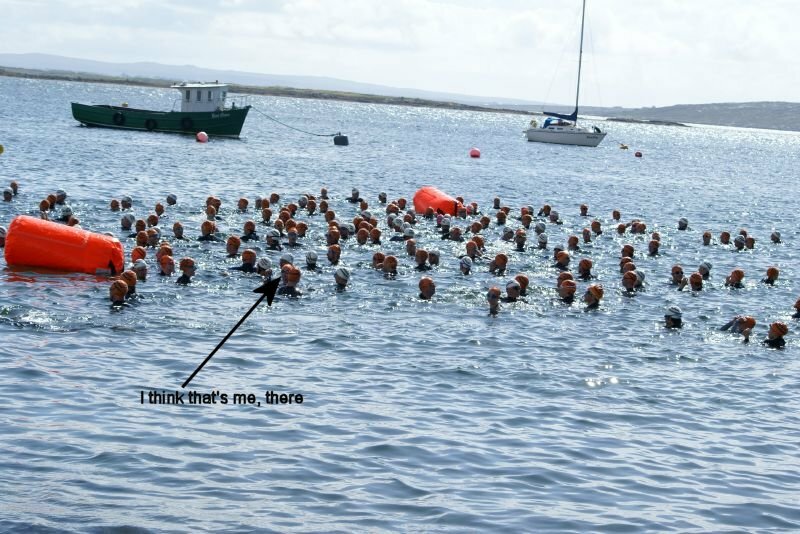 I have nothing but good to say about the Irish triathlon scene, don’t get me wrong. It’s just… Travelling with triathlon gear is expensive. Triathlon is, generally, not the cheapest sport in which to participate, especially when you get going on the open water races. Three disciplines add up to a fair amount of kit, and transporting all that kit on a plane turns into an excuse for the airlines to start recouping all that money they lose out on cheap air deals. I calculated the cost of racing in the Galway tri — flights and entry fee — at around £200. Frood said that’s what credit cards are for. I checked that it would be okay with my dear friend Maura (there’s what possessed me to enter Galway) for me to come and stay with her, and then called the airline. As it turned out, competing in triathlon abroad is a bit like building your own home. You calculate the cost but you should add at least 50% because it always ends up costing more. I’m only going on about the cost because it’s important to realise that neither a Did Not Start (DNS) nor a Did Not Finish (DNF) was going to be an option. Counting it all up I reckon the trip cost me about £350, and no way was I going to spend that and not complete the race. In addition, that amount of financial investment is a serious motivator to put in the work. When you’re spending so much you want to make a good account of yourself. Over the last two or three months before the race I was training twice or three times most weekdays in at least two disciplines. I went from running two or three times a week to running four or five. My swim training went from an average of 1000 – 2000m each session to a minimum of 2000m and usually 3000m. I took a minute off my 750m time. In fact, I smashed this year’s swim goals and was revising them at each monthly review. I should have felt confident. I borrowed a padded bike bag from Munky and the day before departure Frood and I dismantled my Pinarello and covered him in enough bubble wrap to float a Sherman tank. Frood is one of the people who have better things to do with their spare time and was off to Truck the same day I left for Ireland. I had to take a taxi to the airport. Full marks to Aer Arann — those tickets weren’t cheap, but they took good care of my bike and I was permitted the full 15kg free baggage allowance in addition to the trusty steed. I had a day in between arrival and the race itself to get the bike rebuilt and out for a shake-down. I found it amazing that, despite putting tape everywhere I thought possible to indicate where things like the aerobars should be positioned and the level of the handlebars, I still had to make some major tweaks. I seriously recommend, if you’re travelling somewhere that requires dismantling your bike, you leave yourself plenty of time at the other end for sorting it out again. The race day itself dawned bright and sunny and almost windless. That wasn’t expected. The weather forecast had been for southerly winds, causing me a certain amount of dismay, as that was the only direction that could cause chop. I could cope with just about any weather conditions (so I thought) except for serious chop. There didn’t seem to be much in the way of wind at all. This could be good. Maura kindly drove me to Chil Chiarain — no further in miles than it is to most of my races back home, but taking a lot longer because the roads are narrow and twisty. It had rained and there were still clouds in the sky. It looked set for squalls, but that was okay. I like racing in the rain. As long as there was no chop. I had to borrow a track pump from another girl to get my tyres up to full pressure. My Specialized hand pump is light enough to carry on the plane, and very good, but not for race pressure. The only alternative was to waste a newly-purchased CO2 cartridge on pumping up my tyres, and I didn’t want to do that. Although, in hindsight, I might as well have done as I couldn’t bring them home with me anyway. At registration Maura kept an eye on my bike while I went in for body marking. This was her first triathlon and the first thing she noticed was the way all the passing competitors gave the Pinarello a good ogling. It’s the done thing, isn’t it? There are three main perks to competing: bike pr0n, tri totty and the freebies. There was a decent amount of bike pr0n on offer, the totty was more than adequate and the freebies were great. It’s the only tri I’ve been to where the t-shirt was (a) technical, and therefore useful; and (b) available in a girlie fitting and small size! Respect, Galway. Seriously. Transition was quite a way from registration, down on the pier. The Irish experience was largely one of late arrivals: in Scotland you turn up earlier rather than later, and you get your kit sorted out in good time before milling around wishing you’d brought another banana. In Ireland they have to put a big warning in capital letters in the briefing pack: TRANSITION CLOSES AT 10:30, SORRY NO EXCEPTIONS! Only there were, weren’t there? By race briefing the pre-race nerves had turned to nausea and the shakes. This wasn’t helped by the race director saying it had become choppy out there, nor the fact that, even though I regularly do 3000m in training in the pool, 1500m in open water looks a bloody long way: It’s HOW FAR between those buoys? I can barely see the last one! Thankfully I didn’t have to spend long feeling sick. Soon enough it was into the water in one vast mass of orange and white caps and before I knew it I was bobbing around trying to find a good position for the off. The countdown came from the pier, the spectators joining in, and then it was into the blender. I’d just read an article about assertive positioning in Triathlon 220, and I think I coped quite well with swimming in the pack. I was kicked in the face three times and it didn’t put me off. Much. In the bright sunshine navigation was fairly easy: just follow the others as long as they look like they’re going in the right direction. I don’t know how I’d have managed if I’d been at the front. I hadn’t been able to get a good look at the relative positions of the buoys, and they were impossible to see until I was quite close, despite being massive, bright pink space hopper things. Although officially the back leg was the farthest, it was the swim back into shore from the last buoy that took the longest. We must have been against the current. I had to resist the urge to stop and swim down to poke a particularly fine specimen of cauliflower jellyfish, as tempting as it was. Then it was into the shallows where the seaweed was tangling around arms and ankles, before finally my feet could reach bottom and it was a wade to the mat while struggling to get that all-important first arm out. T1 was a dizzy affair. I couldn’t get my suit off my feet and every time I bent down to try to free myself I nearly fell over. I was no longer swimming but my brain hadn’t stopped yet and very much didn’t like being upside down. Eventually I managed to get free of the neoprene, my helmet already on, pulled on cycling shoes — another fight with the fainting feeling — then it was a run through transition to the bottom of the hill up to the road. I felt nauseous, which could have been the seawater but I think was more likely to be the change from swimming to being upright. Almost immediately I passed one of the pointy hat brigade, which cheered me up no end. That first bike leg was fast and smooth, and at one point I was churning along at 55km/h wondering when my heart rate was going to drop out of the high 170s but feeling good on it. Turning left onto the “bog road” the surface deteriorated and the land turned corrugated. I risked falling foul of the blasphemy laws as I hit pothole after pothole. At one point I saw a saddle lying forlornly in the middle of the road. Mechanicals were going to prove a problem for a few people on the bike leg. I was passed by a number of people on the bike, which at the time was pretty demoralising. The sun was hot — how hot I wouldn’t realise until much later — and on the back straight the headwind turned meaty. The biggest annoyance on the bike section had to be the group of guys chain-ganging it, zipping past like it was a stage on Le Tour and they were escorting their sprinter to the Lanterne Rouge. NEED MOAR DRAFT BUSTERS. Into T2, which was appallingly slow, although I couldn’t tell you for why, and then straight into 3km of tortuous ascent in the blazing sun on the run. I saw the clock reading 02:00.01 and realised I was on track for my goal of 3 hours, managed to keep up the pace until out of sight of the spectators, purely for pride’s sake; then, I confess, I walked. The fast guys were already on their way back to the finish. Despair hit me for the first time. Seeing the 1km sign I was surprised — I couldn’t have reached 1km already, surely? But I had 9 more to go and I wasn’t sure I could. My legs felt like old, brittle rubber bands. For the first time ever in any race I wondered if I’d DNF. But thoughts like that aren’t helpful, so I started making deals with myself. Run to that fence post/clump of grass/pothole/pile of rabbit droppings and then we can walk for a bit. We’ll walk this steep bit but then we run for a bit, right? It was incredibly painful, but not in any way that’s easy to describe. I wasn’t particularly out of breath — heart rate in the 170s is higher than I’d like these days, but it’s not a problem. I ran all of Tranent at about 174. I was, fundamentally, overheating. I could feel parts of me shutting down in protest. When I tried to run with no intention of slowing down for a walk, I’d find myself suddenly at a walking pace without having made any conscious decision to walk, simply so I could cool down. A conscious run-walk-run strategy at least allowed me to determine how much I walked and how much I ran, so on the out leg I walked the steep uphill bits and ran the rest. Up and over the hill, down to the turnaround at about 5.5km. On the way back I took advantage of the water station, because I needed to pour some of the damn stuff over my head. I’d donned a Camelbak Alterra in T2 and was already most of the way through the litre of water in there but there wasn’t far to go. At 7.5km it was (mostly) downhill to the finish and I told myself: come on. Two and a half is nothing. You do three times that distance most lunchtimes. Let’s at least run the rest of the race. So I did. I ran the last 2.5km and even managed a sprint finish to cross the line at exactly the same time as the girl trying to overtake me in the last few metres. Full results can be found here. I was second joint equal in the F35-39 age group. Overall 146th out of 176, which is less impressive. Again, it was the run that let me down. That and my complete inability to deal with the heat. Given that I felt absolutely fine within 15 minutes of finishing, when I’d cooled down and got some more water inside me, and I was pretty badly sunburnt, I’d say that my performance suffered from the sunny conditions, although it made everything very pleasant for everyone else. The next day I felt ready for more. Either my recovery is extraordinary or something environmental kept me from pushing as hard as I could. At the end I was literally encrusted with salt from the sweat. The swim leg was storming, for me: hence being passed on the bike wasn’t so bad. I was 61st out of the water and 133rd on the bike. I knew up front that I hadn’t put enough speed work in on the bike so I can’t really complain about that; and I was holding back for the run, which I was only too aware was going to clobber me with righteous pounding. Do it again? Afterwards I was 100% convinced I’d never do another standard. Ever. Ever ever ever. That was three hours of horrible as opposed to a sprint distance hour and a half of horrible. Now though? Now I can see where I went wrong in training, how I could improve, how I could get faster, and, dammit, I want to do a race at that distance I can feel generally good about rather than feeling, overall, generally dissatisfied with my performance. I remember what happened after my first sprint, you see. I hated that, too. And now I do about 6 a year. Maybe I’ll give it another go next year. After all, I can’t compare any other standard to that one, because they’re all so different. If I do, though, I’ll be doing a helluva lot more hill training. And bricks. Many, many bricks. Congratulations and thanks to the Galway Triathlon Club for a well-organised, friendly race and incredibly helpful marshals. In terms of set-up, organisation, and all-round make-a-girl-want-to-do-it-again they’re right up there. And, of course, the location is exquisitely beautiful. Next up: Haddington. Should be interesting to see how a sprint distance feels now.